2004-01-16 Assigned to COLLEGIUM PHARMACEUTICAL, INC. reassignment COLLEGIUM PHARMACEUTICAL, INC. ASSIGNMENT OF ASSIGNORS INTEREST (SEE DOCUMENT FOR DETAILS). Assignors: BUCHWALD, STEPHEN L., SWAGER, TIMOTHY M., RARIY, RAMON V.
One aspect of the present invention relates to compositions and methods for discouraging improper use of habit-forming and addictive drugs, such as oxycodone. In a preferred embodiment, a habit-forming or addictive drug is chemically modified to block its physiological activity until the drug is transformed to a physiologically active form in the mammalian gastrointestinal tract. This application claims the benefit of priority to U.S. Provisional Patent Application serial No. 60/393,876, filed Jul. 5, 2002; and U.S. Provisional Patent Application serial No. 60/463,514, filed Apr. 15, 2003. These embodiments of the present invention, other embodiments, and their features and characteristics, will be apparent from the description, drawings and claims that follow. FIG. 2 depicts a schematic of modified oxycodone demonstrating potential variations in the prodrug architecture, wherein W may be an organic chain of 3, 4 or 5 atoms that may bear substituents or be interrupted by non-carbon atoms including O, S, N, Si, or P; Y may be NH, S, or O; and R may be any organic group, including the carboxyl terminus of an N-acyl amino acid or the carboxy terminus of an oligopeptide. The term “ED 50” means the dose of a drug which produces 50% of its maximum response or effect. Alternatively, the dose which produces a pre-determined response in 50% of test subjects or preparations. The term “LD 50” means the dose of a drug which is lethal in 50% of test subjects. The term “therapeutic index” refers to the therapeutic index of a drug defined as LD 50/ED50. The term “alkyl” refers to the radical of saturated aliphatic groups, including straight-chain alkyl groups, branched-chain alkyl groups, cycloalkyl (alicyclic) groups, alkyl substituted cycloalkyl groups, and cycloalkyl substituted alkyl groups. In certain embodiments, a straight chain or branched chain alkyl has 30 or fewer carbon atoms in its backbone (e.g., C 1-C30 for straight chain, C3-C30 for branched chain), and more preferably 20 or fewer. Likewise, cycloalkyls have from 3-10 carbon atoms in their ring structure, and more preferably have 5, 6 or 7 carbons in the ring structure. The term “aryl” as used herein includes 5-, 6- and 7-membered single-ring aromatic groups that may include from zero to four heteroatoms, for example, benzene, naphthalene, anthracene, pyrene, pyrrole, furan, thiophene, imidazole, oxazole, thiazole, triazole, pyrazole, pyridine, pyrazine, pyridazine and pyrimidine, and the like. Those aryl groups having heteroatoms in the ring structure may also be referred to as “aryl heterocycles” or “heteroaromatics.” The aromatic ring can be substituted at one or more ring positions with such substituents as described above, for example, halogen, azide, alkyl, aralkyl, alkenyl, alkynyl, cycloalkyl, hydroxyl, alkoxyl, amino, nitro, sulfhydryl, imino, amido, phosphonate, phosphinate, carbonyl, carboxyl, silyl, ether, alkylthio, sulfonyl, sulfonamido, ketone, aldehyde, ester, heterocyclyl, aromatic or heteroaromatic moieties, —CF 3, —CN, or the like. The term “aryl” also includes polycyclic ring systems having two or more cyclic rings in which two or more carbons are common to two adjoining rings (the rings are “fused rings”) wherein at least one of the rings is aromatic, e.g., the other cyclic rings can be cycloalkyls, cycloalkenyls, cycloalkynyls, aryls and/or heterocyclyls. The terms “heterocyclyl” or “heterocyclic group” refer to 3- to 10-membered ring structures, more preferably 3- to 7-membered rings, whose ring structures include one to four heteroatoms. Heterocycles can also be polycycles. Heterocyclyl groups include, for example, thiophene, thianthrene, furan, pyran, isobenzofuran, chromene, xanthene, phenoxathiin, pyrrole, imidazole, pyrazole, isothiazole, isoxazole, pyridine, pyrazine, pyrimidine, pyridazine, indolizine, isoindole, indole, indazole, purine, quinolizine, isoquinoline, quinoline, phthalazine, naphthyridine, quinoxaline, quinazoline, cinnoline, pteridine, carbazole, carboline, phenanthridine, acridine, pyrimidine, phenanthroline, phenazine, phenarsazine, phenothiazine, furazan, phenoxazine, pyrrolidine, oxolane, thiolane, oxazole, piperidine, piperazine, morpholine, lactones, lactams such as azetidinones and pyrrolidinones, sultams, sultones, and the like. The heterocyclic ring can be substituted at one or more positions with such substituents as described above, as for example, halogen, alkyl, aralkyl, alkenyl, alkynyl, cycloalkyl, hydroxyl, amino, nitro, sulfhydryl, imino, amido, phosphonate, phosphinate, carbonyl, carboxyl, silyl, ether, alkylthio, sulfonyl, ketone, aldehyde, ester, a heterocyclyl, an aromatic or heteroaromatic moiety, —CF 3, —CN, or the like. The terms “polycyclyl” or “polycyclic group” refer to two or more rings (e.g., cycloalkyls, cycloalkenyls, cycloalkynyls, aryls and/or heterocyclyls) in which two or more carbons are common to two adjoining rings, e.g., the rings are “fused rings”. Rings that are joined through non-adjacent atoms are termed “bridged” rings. Each of the rings of the polycycle can be substituted with such substituents as described above, as for example, halogen, alkyl, aralkyl, alkenyl, alkynyl, cycloalkyl, hydroxyl, amino, nitro, sulfhydryl, imino, amido, phosphonate, phosphinate, carbonyl, carboxyl, silyl, ether, alkylthio, sulfonyl, ketone, aldehyde, ester, a heterocyclyl, an aromatic or heteroaromatic moiety, —CF 3, —CN, or the like. As used herein, the term “nitro” means —NO 2; the term “halogen” designates —F, —Cl, —Br or —I; the term “sulfhydryl” means —SH; the term “hydroxyl” means —OH; and the term “sulfonyl” means —SO2. wherein R 9, R10 and R′10 each independently represent a hydrogen, an alkyl, an alkenyl, —(CH2)m—R8, or R9 and R10 taken together with the N atom to which they are attached complete a heterocycle having from 4 to 8 atoms in the ring structure; R8 represents an aryl, a cycloalkyl, a cycloalkenyl, a heterocycle or a polycycle; and m is zero or an integer in the range of 1 to 8. In certain embodiments, only one of R9 or R10 may be a carbonyl, e.g., R9, R10 and the nitrogen together do not form an imide. In other embodiments, R9 and R10 (and optionally R′10) each independently represent a hydrogen, an alkyl, an alkenyl, or —(CH2)m—R8. Thus, the term “alkylamine” as used herein means an amine group, as defined above, having a substituted or unsubstituted alkyl attached thereto, i.e., at least one of R9 and R10 is an alkyl group. wherein R 9 is as defined above, and R′11 represents a hydrogen, an alkyl, an alkenyl or —(CH2)m—R8, where m and R8 are as defined above. wherein R 9, R10 are as defined above. 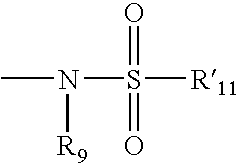 Preferred embodiments of the amide will not include imides which may be unstable. 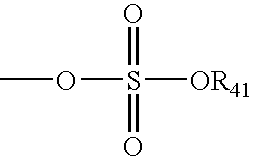 The term “alkylthio” refers to an alkyl group, as defined above, having a sulfur radical attached thereto. 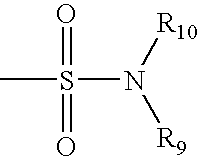 In preferred embodiments, the “alkylthio” moiety is represented by one of —S-alkyl, —S-alkenyl, —S-alkynyl, and —S—(CH 2)m—R8, wherein m and R8 are defined above. Representative alkylthio groups include methylthio, ethyl thio, and the like. wherein X is a bond or represents an oxygen or a sulfur, and R 11 represents a hydrogen, an alkyl, an alkenyl, —(CH2)m—R8 or a pharmaceutically acceptable salt, R′11 represents a hydrogen, an alkyl, an alkenyl or —(CH2)m—R8, where m and R8 are as defined above. Where X is an oxygen and R11 or R′11 is not hydrogen, the formula represents an “ester”. Where X is an oxygen, and R11 is as defined above, the moiety is referred to herein as a carboxyl group, and particularly when R11 is a hydrogen, the formula represents a “carboxylic acid”. Where X is an oxygen, and R′11 is hydrogen, the formula represents a “formate”. 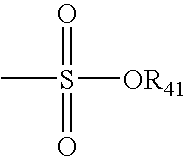 In general, where the oxygen atom of the above formula is replaced by sulfur, the formula represents a “thiolcarbonyl” group. Where X is a sulfur and R11 or R′11 is not hydrogen, the formula represents a “thiolester.” Where X is a sulfur and R11 is hydrogen, the formula represents a “thiolcarboxylic acid.” Where X is a sulfur and R11′ is hydrogen, the formula represents a “thiolformate.” On the other hand, where X is a bond, and R11 is not hydrogen, the above formula represents a “ketone” group. Where X is a bond, and R11 is hydrogen, the above formula represents an “aldehyde” group. The terms “alkoxyl” or “alkoxy” as used herein refers to an alkyl group, as defined above, having an oxygen radical attached thereto. Representative alkoxyl groups include methoxy, ethoxy, propyloxy, tert-butoxy and the like. An “ether” is two hydrocarbons covalently linked by an oxygen. Accordingly, the substituent of an alkyl that renders that alkyl an ether is or resembles an alkoxyl, such as can be represented by one of —O-alkyl, —O-alkenyl, —O-alkynyl, —O—(CH 2)m—R8, where m and R8 are described above. in which R 41 is an electron pair, hydrogen, alkyl, cycloalkyl, or aryl. The abbreviations Me, Et, Ph, Tf, Nf, Ts, and Ms represent methyl, ethyl, phenyl, trifluoromethanesulfonyl, nonafluorobutanesulfonyl, p-toluenesulfonyl and methanesulfonyl, respectively. A more comprehensive list of the abbreviations utilized by organic chemists of ordinary skill in the art appears in the first issue of each volume of the  Journal of Organic Chemistry; this list is typically presented in a table entitled Standard List of Abbreviations. The abbreviations contained in said list, and all abbreviations utilized by organic chemists of ordinary skill in the art are hereby incorporated by reference. in which R 41 is as defined above. in which R 9 and R′11 are as defined above. in which R 9 and R10 are as defined above. in which R 44 is selected from the group consisting of hydrogen, alkyl, alkenyl, alkynyl, cycloalkyl, heterocyclyl, aryl, or heteroaryl. in which R 44 is selected from the group consisting of hydrogen, alkyl, alkenyl, alkynyl, cycloalkyl, heterocyclyl, aralkyl, or aryl. 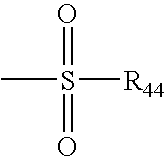 wherein Q 1 represented S or O, and each R46 independently represents hydrogen, a lower alkyl or an aryl, Q2 represents O, S or N. When Q1 is an S, the phosphoryl moiety is a “phosphorothioate”. The phrase “protecting group” as used herein means temporary substituents which protect a potentially reactive functional group from undesired chemical transformations. Examples of such protecting groups include esters of carboxylic acids, silyl ethers of alcohols, and acetals and ketals of aldehydes and ketones, respectively. The field of protecting group chemistry has been reviewed (Greene, T. W.; Wuts, P. G. M.  Protective Groups in Organic Synthesis, 2nd ed. ; Wiley: New York, 1991). X is —CO-alkyl, —CO-aryl, —CO-aralkyl, —CO-heteroaryl, —CO-heteroaralkyl, —CO 2-alkyl, —CO2-aryl, —CO-NHalkyl, —CO-NHaryl, the carboxy terminus of an N-acyl amino acid or the carboxy terminus of an oligopeptide. In a further embodiment, the present invention relates to a compound of formula I and the attendant definitions, wherein W is —CH 2CH2CH2— or —CH2CH2CH2CH2—. In a further embodiment, the present invention relates to a compound of formula I and the attendant definitions, wherein D is a radical of oxycodone and W is —CH 2CH2CH2— or CH2CH2CH2CH2—. In a further embodiment, the present invention relates to a compound of formula I and the attendant definitions, wherein W is —CH 2CH2CH2— or —CH2CH2CH2CH2—; and Y is NH. In a further embodiment, the present invention relates to a compound of formula I and the attendant definitions, wherein W is —CH 2CH2CH2— or —CH2CH2CH2CH2—; and X is —CO-alkyl or the carboxy terminus of an N-acyl amino acid or the carboxy terminus of an oligopeptide. In a further embodiment, the present invention relates to a compound of formula I and the attendant definitions, wherein D is a radical of oxycodone, W is —CH 2CH2CH2— or —CH2CH2CH2CH2—, and Y is NH. In a further embodiment, the present invention relates to a compound of formula I and the attendant definitions, wherein D is a radical of oxycodone, W is —CH 2CH2CH2— or —CH2CH2CH2CH2—, and X is —CO-alkyl or the carboxy terminus of an N-acyl amino acid or the carboxy terminus of an oligopeptide. In a further embodiment, the present invention relates to a compound of formula I and the attendant definitions, wherein W is —CH 2CH2CH2— or —CH2CH2CH2CH2—, Y is NH, and X is —CO-alkyl or the carboxy terminus of an N-acyl amino acid or the carboxy terminus of an oligopeptide. In a further embodiment, the present invention relates to a compound of formula I and the attendant definitions, wherein D is a radical of oxycodone, W is —CH 2CH2CH2— or —CH2CH2CH2CH2—, Y is NH, and X is —CO-alkyl or the carboxy terminus of an N-acyl amino acid or the carboxy terminus of an oligopeptide. In a further embodiment, the present invention relates to a method of treating a mammal for pain relief comprising orally administering to the mammal a compound of formula I and the attendant definitions, wherein W is —CH 2CH2CH2— or —CH2CH2CH2CH2—. In a further embodiment, the present invention relates to a method of treating a mammal for pain relief comprising orally administering to the mammal a compound of formula I and the attendant definitions, wherein D is a radical of oxycodone and W is —CH 2CH2CH2— or —CH2CH2CH2CH2—. In a further embodiment, the present invention relates to a method of treating a mammal for pain relief comprising orally administering to the mammal a compound of formula I and the attendant definitions, wherein W is —CH 2CH2CH2— or —CH2CH2CH2CH2—; and Y is NH. In a further embodiment, the present invention relates to a method of treating a mammal for pain relief comprising orally administering to the mammal a compound of formula I and the attendant definitions, wherein W is —CH 2CH2CH2— or —CH2CH2CH2CH2—; and X is —CO-alkyl or the carboxy terminus of an N-acyl amino acid or the carboxy terminus of an oligopeptide. In a further embodiment, the present invention relates to a method of treating a mammal for pain relief comprising orally administering to the mammal a compound of formula I and the attendant definitions, wherein D is a radical of oxycodone, W is —CH 2CH2CH2— or —CH2CH2CH2CH2—, and Y is NH. In a further embodiment, the present invention relates to a method of treating a mammal for pain relief comprising orally administering to the mammal a compound of formula I and the attendant definitions, wherein D is a radical of oxycodone, W is —CH 2CH2CH2— or —CH2CH2CH2CH2—, and X is —CO-alkyl or the carboxy terminus of an N-acyl amino acid or the carboxy terminus of an oligopeptide. In a further embodiment, the present invention relates to a method of treating a mammal for pain relief comprising orally administering to the mammal a compound of formula I and the attendant definitions, wherein W is —CH 2CH2CH2— or —CH2CH2CH2CH2—, Y is NH, and X is —CO-alkyl or the carboxy terminus of an N-acyl amino acid or the carboxy terminus of an oligopeptide. In a further embodiment, the present invention relates to a method of treating a mammal for pain relief comprising orally administering to the mammal a compound of formula I and the attendant definitions, wherein D is a radical of oxycodone, W is —CH 2CH2CH2— or —CH2CH2CH2CH2—, Y is NH, and X is —CO-alkyl or the carboxy terminus of an N-acyl amino acid or the carboxy terminus of an oligopeptide. In a further embodiment, the present invention relates to a method of making a drug more abuse resistant comprising bonding a radical of formula II and the attendant definitions to the drug through a nucleophile present on the drug, wherein W is —CH 2CH2CH2— or —CH2CH2CH2CH2—. In a further embodiment, the present invention relates to a method of making a drug more abuse resistant comprising bonding a radical of formula II and the attendant definitions to the drug through a nucleophile present on the drug, wherein the drug is oxycodone and W is —CH 2CH2CH2— or —CH2CH2CH2CH2—. In a further embodiment, the present invention relates to a method of making a drug more abuse resistant comprising bonding a radical of formula II and the attendant definitions to the drug through a nucleophile present on the drug, wherein the drug is oxycodone, W is —CH 2CH2CH2— or —CH2CH2CH2CH2—, and Y is NH. In a further embodiment, the present invention relates to a method of making a drug more abuse resistant comprising bonding a radical of formula II and the attendant definitions to the drug through a nucleophile present on the drug, wherein the drug is oxycodone, W is —CH 2CH2CH2— or —CH2CH2CH2CH2—, and X is —CO-alkyl or the carboxy terminus of an N-acyl amino acid or the carboxy terminus of an oligopeptide. In a further embodiment, the present invention relates to a method of making a drug more abuse resistant comprising bonding a radical of formula II and the attendant definitions to the drug through a nucleophile present on the drug, wherein W is —CH 2CH2CH2— or —CH2CH2CH2CH2—, Y is NH, and X is —CO-alkyl or the carboxy terminus of an N-acyl amino acid or the carboxy terminus of an oligopeptide. In a further embodiment, the present invention relates to a method of making a drug more abuse resistant comprising bonding a radical of formula II and the attendant definitions to the drug through a nucleophile present on the drug, wherein the drug is oxycodone, W is —CH 2CH2CH2— or —CH2CH2CH2CH2—, Y is NH, and X is —CO-alkyl or the carboxy terminus of an N-acyl amino acid or the carboxy terminus of an oligopeptide. Toxicity and therapeutic efficacy of subject compositions may be determined by standard pharmaceutical procedures in cell cultures or experimental animals, e.g., for determining the LD 50 and the ED50. The data obtained from the cell culture assays and animal studies may be used in formulating a range of dosage for use in humans. The dosage of any subject composition lies preferably within a range of circulating concentrations that include the ED 50 with little or no toxicity. The dosage may vary within this range depending upon the dosage form employed and the route of administration utilized. For compositions of the present invention, the therapeutically effective dose may be estimated initially from cell culture assays. 1. A compound comprising a drug attached to an organic chain via a nucleophile present on the drug, wherein the organic chain has, at the end distal to the drug, an organic group susceptible to enzymatic cleavage and substantially unsusceptible to non-enzymatic cleavage. 2. 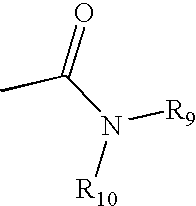 The compound of claim 1, wherein the distal organic group is an amide. 3. The compound of claim 1, wherein the nucleophile and the organic chain form an ester. 4. The compound of claim 3, wherein the ester is cleaved via an intramolecular reaction after enzymatic cleavage of the distal organic group. 5. 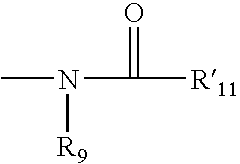 The compound of claim 4, wherein the distal organic group is an amide. 6. The compound of claim 1, wherein the drug is a pain relief drug. 7. The compound of claim 1, wherein the drug is alphacetylmethadol hydrochloride, anileridine, apomorphine, bemidone, betacetylmethadol hydrochloride, buprenorphine hydrochloride, butorphanol tartrate, codeine, dezocine, dihydrocodeine, dihydromorphine, dipanone hydrochloride, eptazocine hydrobromide, ethylmorphine, etorphine hydrochloride, hydromorphone, ketobemidone, levorphanol tartrate, loperamide, meptazinol hydrochloride, methyldihydromorphinone, nalbuphine hydrochloride, nalbuphine hydrochloride, normorphine, oxycodone, oxymorphone, pentazocine, piminodine, tramadol, allobarbitone, alprazolan, amylobarbitone, barbitone sodium, butobarbitone, captodiame hydrochloride, chloral betaine, chloral hydrate, chloralose, chlorhexadol, chlormethiazole edisylate, cinolazepam, potassium clorazepate, cyclobarbitone calcium, delorzepam, difebarbamate, enciprazine hydrochloride, flunitrazepam, hexobarbitone sodium, ibomal, lorazepam, lormetazepam, meprobamate, methylpentynol, midazolam maleate, oxazepam, pentabarbitone calcium, phenprobamate, proxibarbal, quinalbaritone, quinalbarbitone sodium, secbutobarbitone sodium, temazepam, triclofos sodium, zalepan, or zolazepam hydrochloride. 8. The compound of claim 1, wherein the drug is oxycodone. 9. A pharmaceutical composition, comprising the compound of claim 1; and a pharmaceutically acceptable excipient. 10. A method of treating pain in a mammal, comprising administering to a mammal in need thereof a therapeutically effective amount of the compound of claim 6. 11. The method of claim 10, wherein the mammal is a primate, equine, canine, or feline. 12. The method of claim 10, wherein the mammal is a human. 13. A method of making a drug more difficult to abuse, comprising bonding an organic radical to the drug at one end of the organic radical via a nucleophile on the drug, wherein said organic radical comprises a functional group that is susceptible to enzymatic cleavage and substantially unsusceptible to non-enzymatic cleavage. 14. A kit comprising the compound of claim 1 and instructions for use thereof. X is —CO-alkyl, —CO-aryl, —CO-aralkyl, —CO-heteroaryl, —CO-heteroaralkyl, —CO2-alkyl, —CO2-aryl, —CO-NHalkyl, —CO-NHaryl, the carboxy terminus of an N-acyl amino acid or the carboxy terminus of an oligopeptide. 16. The compound of claim 15, wherein D is a radical of a pain relief drug. 17. The compound of claim 15, wherein D is a radical of alphacetylmethadol hydrochloride, anileridine, apomorphine, bemidone, betacetylmethadol hydrochloride, buprenorphine hydrochloride, butorphanol tartrate, codeine, dezocine, dihydrocodeine, dihydromorphine, dipanone hydrochloride, eptazocine hydrobromide, ethylmorphine, etorphine hydrochloride, hydromorphone, ketobemidone, levorphanol tartrate, loperamide, meptazinol hydrochloride, methyldihydromorphinone, nalbuphine hydrochloride, nalbuphine hydrochloride, normorphine, oxycodone, oxymorphone, pentazocine, piminodine, tramadol, allobarbitone, alprazolan, amylobarbitone, barbitone sodium, butobarbitone, captodiame hydrochloride, chloral betaine, chloral hydrate, chloralose, chlorhexadol, chlormethiazole edisylate, cinolazepam, potassium clorazepate, cyclobarbitone calcium, delorzepam, difebarbamate, enciprazine hydrochloride, flunitrazepam, hexobarbitone sodium, ibomal, lorazepam, lormetazepam, meprobamate, methylpentynol, midazolam maleate, oxazepam, pentabarbitone calcium, phenprobamate, proxibarbal, quinalbaritone, quinalbarbitone sodium, secbutobarbitone sodium, temazepam, triclofos sodium, zalepan, or zolazepam hydrochloride. 18. The compound of claim 15, wherein D is a radical of oxycodone. 19. The compound of claim 15, wherein W is —CH2CH2CH2— or —CH2CH2CH2CH2—. 20. The compound of claim 15, wherein Y is NH. 21. The compound of claim 15, wherein X is —CO-alkyl or the carboxy terminus of an N-acyl amino acid or the carboxy terminus of an oligopeptide. 22. The compound of claim 15, wherein D is a radical of oxycodone and W is —CH2CH2CH2 —or —CH2CH2CH2CH2—. 23. The compound of claim 15, wherein D is a radical of oxycodone and Y is NH. 24. The compound of claim 15, wherein D is a radical of oxycodone and X is —CO-alkyl or the carboxy terminus of an N-acyl amino acid or the carboxy terminus of an oligopeptide. 25. The compound of claim 15, wherein W is —CH2CH2CH2— or —CH2CH2CH2CH2—; and Y is NH. 26. The compound of claim 15, wherein W is —CH2CH2CH2— or —CH2CH2CH2CH2—; and X is —CO-alkyl or the carboxy terminus of an N-acyl amino acid or the carboxy terminus of an oligopeptide. 27. The compound of claim 15, wherein Y is NH and X is —CO-alkyl or the carboxy terminus of an N-acyl amino acid or the carboxy terminus of an oligopeptide. 28. The compound of claim 15, wherein D is a radical of oxycodone, W is —CH2CH2CH2— or —CH2CH2CH2CH2—, and Y is NH. 29. The compound of claim 15, wherein D is a radical of oxycodone, W is —CH2CH2CH2— or —CH2CH2CH2CH2—, and X is —CO-alkyl or the carboxy terminus of an N-acyl amino acid or the carboxy terminus of an oligopeptide. 30. The compound of claim 15, wherein D is a radical of oxycodone, Y is NH, and X is —CO-alkyl or the carboxy terminus of an N-acyl amino acid or the carboxy terminus of an oligopeptide. 31. The compound of claim 15, wherein W is —CH2CH2CH2— or —CH2CH2CH2CH2—, Y is NH, and X is —CO-alkyl or the carboxy terminus of an N-acyl amino acid or the carboxy terminus of an oligopeptide. 32. The compound of claim 15, wherein D is a radical of oxycodone, W is —CH2CH2CH2— or —CH2CH2CH2CH2—, Y is NH, and X is —CO-alkyl or the carboxy terminus of an N-acyl amino acid or the carboxy terminus of an oligopeptide. 33. A pharmaceutical composition, comprising the compound of claim 15; and a pharmaceutically acceptable excipient. 34. A kit comprising the compound of claim 15 and instructions for use thereof. 35. A method of treating pain in a mammal, comprising administering to a mammal in need thereof a therapeutically effective amount of the compound of claim 16. 36. The method of claim 35, wherein the mammal is a primate, equine, canine or feline. 37. The method of claim 35, wherein the mammal is a human. 39. The method of claim 38, wherein the drug is a pain relief drug. 40. The method of claim 38, wherein the drug is alphacetylmethadol hydrochloride, anileridine, apomorphine, bemidone, betacetylmethadol hydrochloride, buprenorphine hydrochloride, butorphanol tartrate, codeine, dezocine, dihydrocodeine, dihydromorphine, dipanone hydrochloride, eptazocine hydrobromide, ethylmorphine, etorphine hydrochloride, hydromorphone, ketobemidone, levorphanol tartrate, loperamide, meptazinol hydrochloride, methyldihydromorphinone, nalbuphine hydrochloride, nalbuphine hydrochloride, normorphine, oxycodone, oxymorphone, pentazocine, piminodine, tramadol, allobarbitone, alprazolan, amylobarbitone, barbitone sodium, butobarbitone, captodiame hydrochloride, chloral betaine, chloral hydrate, chloralose, chlorhexadol, chlormethiazole edisylate, cinolazepam, potassium clorazepate, cyclobarbitone calcium, delorzepam, difebarbamate, enciprazine hydrochloride, flunitrazepam, hexobarbitone sodium, ibomal, lorazepam, lormetazepam, meprobamate, methylpentynol, midazolam maleate, oxazepam, pentabarbitone calcium, phenprobamate, proxibarbal, quinalbaritone, quinalbarbitone sodium, secbutobarbitone sodium, temazepam, triclofos sodium, zalepan, or zolazepam hydrochloride. 41. The method of claim 38, wherein the drug is oxycodone. 42. The method of claim 38, wherein W is —CH2CH2CH2— or —CH2CH2CH2CH2—. 43. The method of claim 38, wherein Y is NH. 44. The method of claim 38, wherein X is —CO-alkyl or the carboxy terminus of an N-acyl amino acid or the carboxy terminus of an oligopeptide. 45. The method of claim 38, wherein the drug is oxycodone; and W is W is —CH2CH2CH2— or —CH2CH2CH2CH2—. 46. The method of claim 38, wherein the drug is oxycodone; and Y is NH. 47. The method of claim 38, wherein the drug is oxycodone; and X is —CO-alkyl or the carboxy terminus of an N-acyl amino acid or the carboxy terminus of an oligopeptide. 48. The method of claim 38, wherein Y is NH; and X is —CO-alkyl or the carboxy terminus of an N-acyl amino acid or the carboxy terminus of an oligopeptide. 49. The method of claim 38, wherein the drug is oxycodone, W is —CH2CH2CH2— or —CH2CH2CH2CH2—, and Y is NH. 50. The method of claim 38, wherein the drug is oxycodone, W is —CH2CH2CH2— or —CH2CH2CH2CH2—, and X is —CO-alkyl or the carboxy terminus of an N-acyl amino acid or the carboxy terminus of an oligopeptide. 51. The method of claim 38, wherein the drug is oxycodone, Y is NH, and X is —CO-alkyl or the carboxy terminus of an N-acyl amino acid or the carboxy terminus of an oligopeptide. 52. The method of claim 38, wherein W is —CH2CH2CH2— or —CH2CH2CH2CH2—, Y is NH, and X is —CO-alkyl or the carboxy terminus of an N-acyl amino acid or the carboxy terminus of an oligopeptide. 53. The method of claim 38, wherein the drug is oxycodone, W is —CH2CH2CH2— or —CH2CH2CH2CH2—, Y is NH, and X is —CO-alkyl or the carboxy terminus of an N-acyl amino acid or the carboxy terminus of an oligopeptide. FI77849C (en) 1989-05-10 Foerfarande Foer framstaellning of pharmacologically active 4-aminoalkylene-2 ​​(3H) -indoloner. ES2242398T3 (en) 2005-11-01 Stabilization of compositions containing enzyme inhibitors of angiotensin converting using magnesium oxide.